Elephants talk to each other by making sounds called "tummy rumbles"
Elephants can swim in water - they use their trunk to breathe in deep water. Elephants are herbivores - they eat leaves, twigs, bamboo and roots. Elephants drink plenty of water. An elephant needs to drink 200+ litres of water a day. 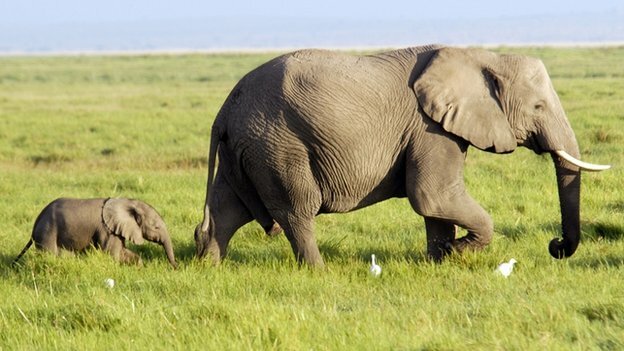 An Elephant can smell water 3 miles away. It could carry 2 gallons of water in its trunk. Elephants live for 70 - 80 years. An elephant weigh about 10,000+ pounds and can reach the heigh of 8+ feet. The biggest danger for Elephants are Humans. They mercilessly kill elephants for their tusk.